The garden seeds are all here, early summer bulbs have started to arrive, and lawn fertilizer is stacked high. We are unpacking trees and shrubs from the winter holding beds and new plants have started arriving from nurseries. Flowering Pansies should start arriving by mid-March. Onion bulbs are in and potato starts should arrive soon. Pottery is getting unpacked and priced, and fountains and statuary are here. Fruit trees are here! 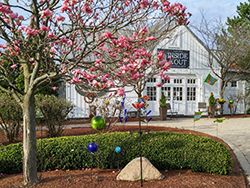 Early spring is the time to buy fruit trees. We have also taken delivery of some blueberries, raspberries and figs. As spring progresses, strawberries, gooseberries and currents will arrive. Hey! Spring’s here…almost, in fits and starts. March is kind of a four season month; you never know what weather the next day will bring. But it is a great time to get some bright colors in a drab landscape, by putting in some hardy annuals that bloom in cool temps, and shrug off even a light frost. For those really cold mornings a quick covering will protect these gems till the sun shines n them. Here are a few cool weather annuals for pots, patios and garden beds. Violoas (Johny Jump-ups); Small cousin to the Pansies in bold colors. 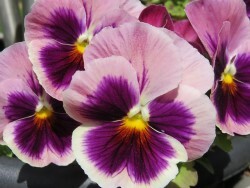 Pansies; reliable standby for bright colors continuous bloom and toughness. Dianthus (Pinks) Shades of pink, very tough, that stand on sturdy stems. Snapdragon; Tall and spiky, grow from starts or seed, very easy. Osteospermum; (African Daisy) Compact daisy-like bloom in interesting colors. Ranunculus (Spring Rose); Lush, rose-like blooms in bright and pastel colors. Sweet Pea; sow from seed. Very easy and interesting blooms. Alyssum; clusters of tiny white blooms make good accent or border plants. Dusty Miller; Fussy silvery foliage plant is great focal plant in pot or background in bed. Visit the newest member of the Oakland Nursery family! Learn more here. Protect fruit tree blooms from frost. Sharpen mower blades, check power equipment. Stop by Oakland to buy garden seeds. Sow seeds that need 8-10 weeks before transplant. Clean last of old foliage from perennials. Cut back ornamental grasses, roses , re-twig dogwoods, and willow cultivars. Feed trees, shrubs, hedges, and fruits if needed. Click on These Links for Informative Topics. March is when Ohio starts to see the migration of birds into and through our state to summer nesting territories. Make sure you keep your feeders full of fresh seed, mealworms, suet and fruit to attract a wide variety of our native feathered friends, and if you are lucky, maybe an exotic visitor just passing through! If you are really into life in the outdoors in the spring, these natural areas provide opportunities to see birds you could never attract to your yard, due to habitat requirements. Blendon Woods Metro Park: Very close to us Gahanna and New Albany residents! The 11 acre Thoreau Lake has 2 elevated observation platforms for observing waterfowl and nesting birds. Hoover Reservoir: When the water level goes down, the mud flats of Hoover provide excellent habitat for many species of native and migrating wading birds and waterfowl.